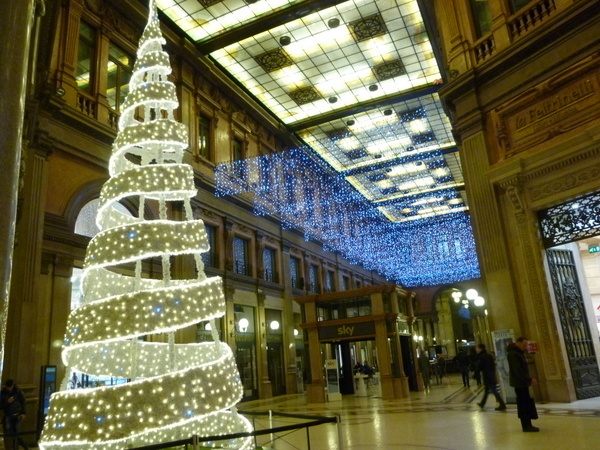 The Galleria on Via del Corso. that was a false start: the “season” doesn’t kick off in Italy until L’immacolata, December 8, the celebration of the Immaculate Conception. The season does not end at midnight on December 31. 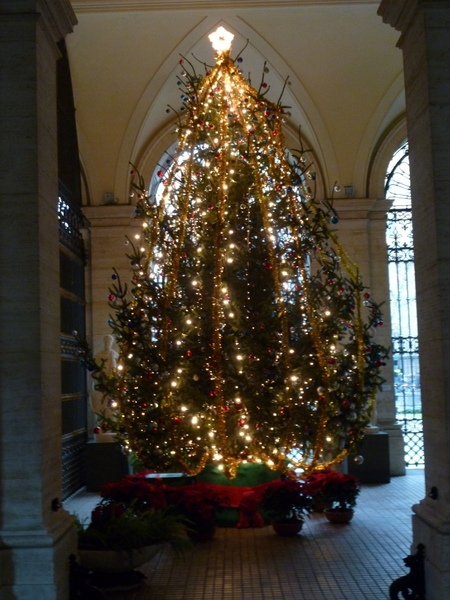 Rather, the holiday season lasts until Epiphany, January 6. 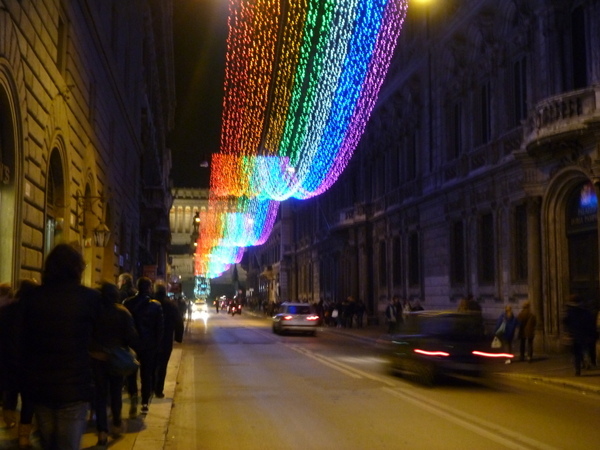 3 years ago, the lights on Via del Corso celebrated Italy’s 150th year with red, white & green lights. This year, a rainbow. December, but the majority are not illuminated until the 8th. One barely hears a Christmas Carol outside of a concert or church venue until this very week of Christmas. The music continues to be part of the background until Epiphany. The lack of Christmas music early in the month is almost profound. In fact, less than two weeks ago I was having my nails done and listening to old Beach Boys and other seasonally non-specific American music (very popular here at all times of the year). While shopping at a major department store on the 14th we saw lots of decorations and holiday merchandise, but no seasonal soundtrack. Odd but appealing, this absence of public holiday music made it more fun to listen to our collection of 752 holiday songs on iTunes. This priceless statue, Venus After the Bath, by Giambologna is in the U.S. Embassy. 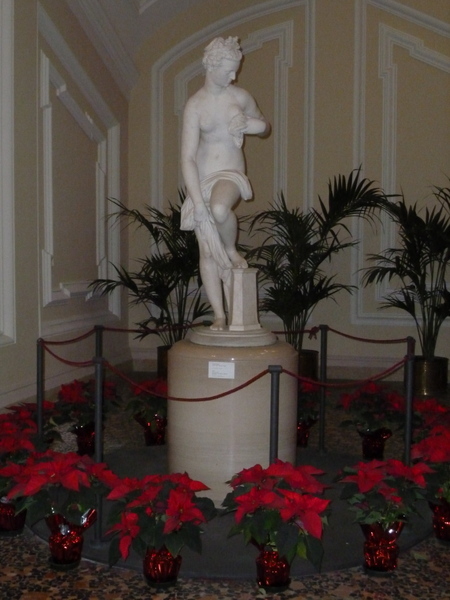 Here she stands amidst a display of poinsettias that only serve to make her more beautiful. So what did Ric and Laurel do? In the week following L’Immacolata, the Ambassador held a reception for all Embassy employees at his beautiful residence, Villa Taverna, my boss held a party at his apartment, and we went to an Advent concert at La Chiesa dei Portoghesi. This church has a fabulous organ on which an amazingly talented organist played an improvisational concert. We’ve never heard anything like it: non-traditional, more akin to a jazz session. 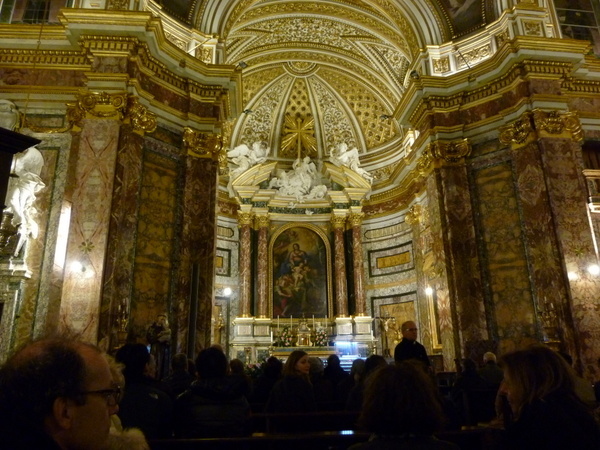 Seat of the Portuguese Catholic Church in Rome with an exceptional organ and organist. 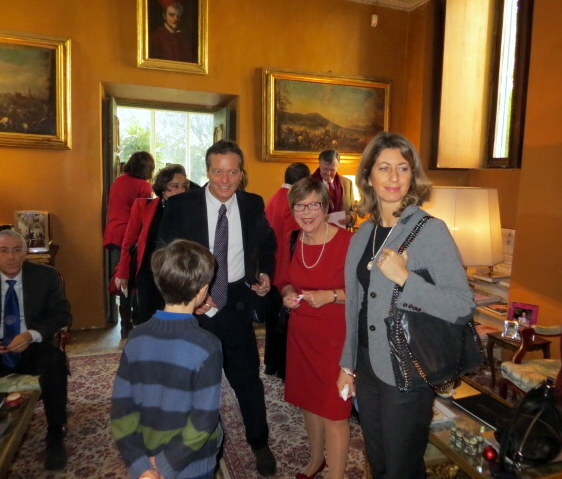 We were delighted to be invited to the Boncompangi Ludovisi home at Villa Aurora for a party on December 21, where the Prince and Princess (see Evening with an American Princess) entertained the residents of an orphanage they support. Tucked into the evenings here-and-there, we wandered the city viewing the lights, baked Swedish Kringlor (pastries) as gifts for several people, and decorated Casa di Barton. 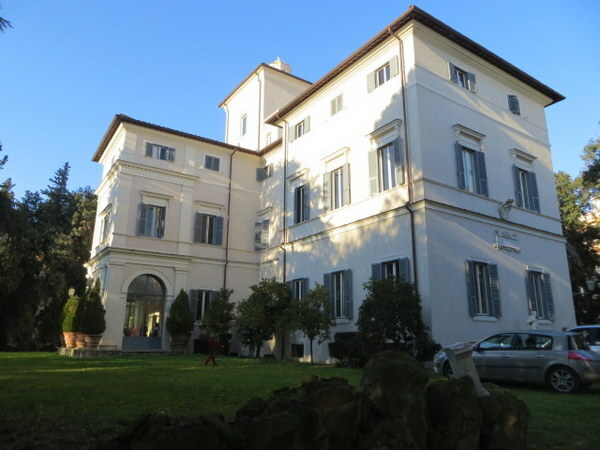 The magificent Villa Aurora, on a hill just a few steps off Via V. Veneto. The Aurora Room, with it’s famous fresco, and a gigantic tree. Leo (back to camera), Francesco, and Alessandra – with me in the middle – enjoy one of the elegant salons at Villa Aurora. A lot is crammed into two-and-a-half weeks from l’Immacolata to Christmas, versus the four-or-so weeks we have in the U.S. from Thanksgiving. Last-minute shopping is also a tradition of the season here as in North America. Every day beginning the 18th, the traffic became more and more intense, the horns sounding more frequently and with greater than usual annoyance. But after the usual pre-Christmas recitals, concerts, parties and receptions, almost two weeks of the holiday season remain and we take 4 holidays: Christmas, Santo Stefano (26th), New Year’s Day, and Epiphany (January 6). Gotta love a schedule like that. Clearly there is no separation of Church and State, although Ric says that since the Carabinieri put their nativity scene outside of the station at headquarters in Parioli, that’s sufficient separation. 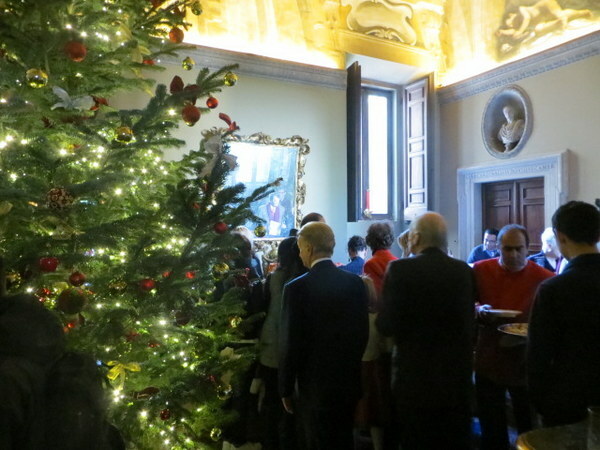 The tree in Palazzo Margherita, the U.S. Embassy, sparkles in red, white and blue. 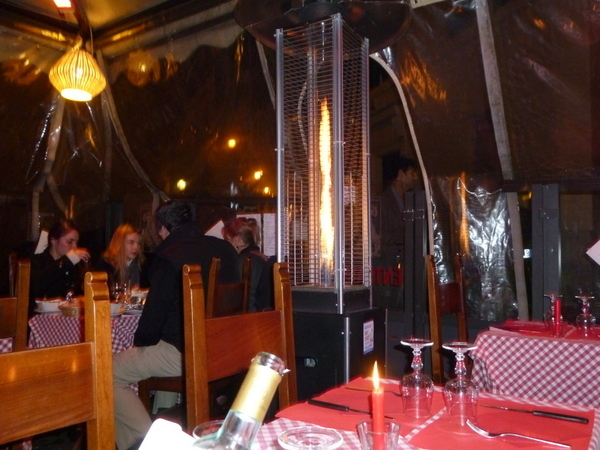 This is outdoor space in 3 season, but for winter, encased in a transparent plastic “tent” heated by flaming torches. Francesco’s policy of inclusion is working because lightening did not strike our Lutheran selves. At the fashionable hour of 21:00, we took ourselves to our favorite trattoria where we have dined the last three Christmas Eves. They serve an all fish dinner, including mussels sautéed in wine (this is the restaurant where I learned to love cozze), shrimp pate, smoked salmon, marinated anchovies (yum!) and insalata al mare. That was just the antipasto course! Seafood risotto and paccheri with shellfish comprised the primi, and our entrée (secondi) was a whole steamed seabass (spigola) served with puntarelle bathed in an anchovy sauce. Two-and-a-half hours later we headed for home. Yes, we have become quite Roman in our dining hours and duration. We also ate all’aperto in that most restaurants have their outdoor tables encased in a plastic tent with heaters making it warm enough to remove your coat and be comfortable unless a high wind is blowing. Christmas Eve by the light of the flaming heaters. The waiter took our picture…. I’d had an 18 hour day by this point. That’s my excuse and I’m sticking to it. 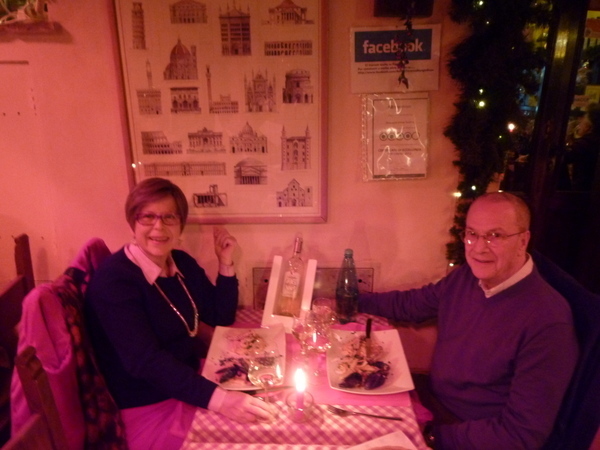 The eating must continue, of course, but we chose to forego the family tradition of Swedish plättar (pancakes) and save ourselves for Christmas Lunch, a two-hour affair at a quaint restaurant in the ghetto of Rome. All restaurants and shops are open in this quartiere on Christmas (unless it is Shabbat), making it a convivial destination with some fine options. Many Italians dine out on Christmas Day, we have found, so reservations are essential. There were quite a few people waiting hopefully for a table outside the restaurants lining Via Portico d’Ottavia. We waltzed right in at 14:00 to a fine table in the back by the garden. We caught up with the Bartons of Omaha Christmas night, and look forward to their invasion visit in August. We also peeked in on Derek via Skype. With a few more Skype sessions planned, by the end of the season we will have seen many friends and family from afar. We will wrap up the season with a day of repose today, Santo Stefano. A wind-and-rain storm last night makes staying inside seem like the best idea. The weekend will have us wandering the streets again (have to work on Friday), but January 1 we’ll take off for Switzerland, a mutual gift to each other: Winter Hiking in the Berner Oberland. I’ll be sure to post news of our trip. Many thanks for cards, e-cards and various greetings sent our way. However you choose to celebrate, we wish you the very best! Buon Natale, Felice 2014, e tanti tanti auguri! 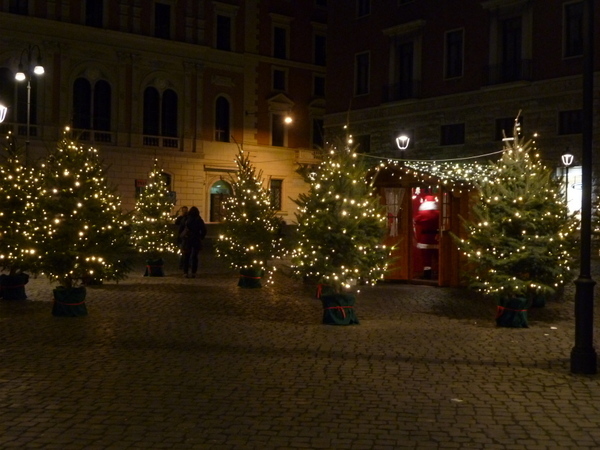 In a piazza, a forest of Christmas trees surrounds a little cabin where Babbo Natale hears the wishes of the bambini. 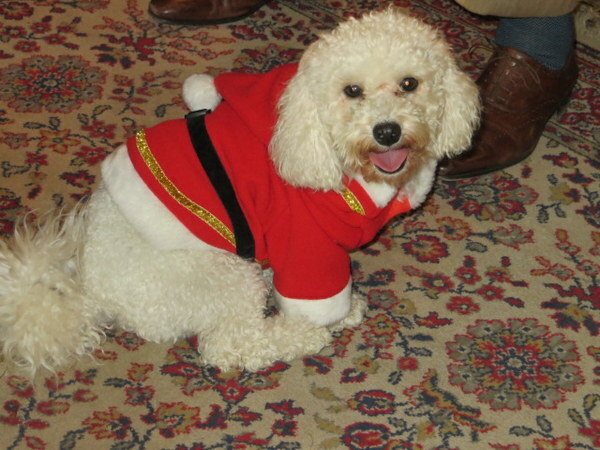 One of Princess Rita’s bichon frises dresses for the occasion.